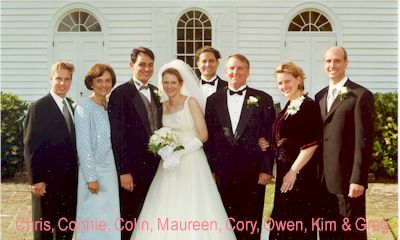 From Owen and Connie HAWKINS: They have added a new member to the Hawkins clan, Colin married Maureen in South Carolina (See photo). They are now living in nearby Mountain View. Owen & Connie did more world traveling by visiting such places as Hawaii, the Calgary Stampede, Hudson Bay to see the polar bears, Marthas Vineyard (To see Martha Stewart? ), Chicago and Disneyworld. Owen went off on his own to see a total eclipse of the sun in Turkey. Owen is now an expert in Surround Sound, converting the house into a rockin retreat. He now plays more golf than before. Connie still enjoys her horse riding. And maybe theyll come out to Florida again to see a Shuttle launch. From Larry and Penny GOOCH: They have a new grandson, Brian, a third focal point of their attention. They took a trip to the Cayman Islands and the California Coast. Daughter, Winnie, is a published author, having put together a childs book to help support the child care center where her baby goes(with Moms help). Larry says try www.mammabear.com. Penny and Larry are pursuing the hobby of cooking. The house is full of gadgets and they have their chef jackets. Their recipes are in packets and I hope they can hack it. From Judy and John DINSMORE: They bragged about having a computer-free household and no ATM cards. (Holy smokes, you are missing the essence of stress and worry in modern America. Twenty years from now you wont be able to talk about the good old days.) John has a hobby that revolves around old John Deere tractors. Sounds interesting. Tell me more. Judy makes quilts and does embroidering. They sent pictures of two grandchildren and evidently enjoy spending time with them at every opportunity. They quoted from a friend who said , "Growing old aint for sissies." I can vouch for that. From Bill & Sue HAUGEN: Bill still works for Boeing and Sue continues her volunteer work. All the children and grandchildren are just doing great. Bill & Sue went to San Antonio to help Bills Mom move; Sue and her Dad went to Los Angeles from Wash. DC, by Amtrak; weddings in Calif. Colo. and Ala; and a 16 day trip to Italy for their 36th anniversary. Sounds like a busy but enjoyable year. From Willie & Nancy Gray: Willie has been retired for over a year now and does part time work at a local golf course , for the free golf, Im sure. He did some consulting for Lockheed Martin, which cut into his golf game. Nancy is still teaching at the Montessori school but vows for the umpteenth time to retire. They took a family trip to Minnesota where Willie had a chance to go Walleye fishing in the wilderness. 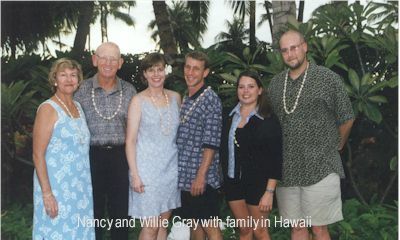 They also went back to their old location in Hawaii to meet old friends and enjoy a reunion(See photo). Young Larry is managing Garrisons Restaurant in Atlanta; so Willie and Nancy tried their fare and highly recommend it. From Gail & Peggy PECK: They went to one side of the familys reunion (like that grammar?) in San Marcos, TX, and then had the other side of the family gather in Las Vegas, their hometown. Peggy had more neck cancer problems. There was surgery in May and a summer of radiation treatments. (Gail put out an urgent request over the Redtag Net for more information on Peggys cancer. I havent been on the net in a couple of weeks so Im not updated on her condition. We all pray for her full and speedy recovery. ) They have really used the little airplane this year. They went to San Diego for lunch with their daughter and husband; then they flew another daughter and 2 friends to Oregon for a wedding in Gails plane. On Labor Day they toured Jackson Hole. There were two trips to Phoenix. Then they took Grandpa Peck to San Antonio for his 60th Flying Class Reunion. Can you believe that? Gail is working full time at the Weapons School teaching F-15 Armament. Daughter, Jen, has been elected President of the UNLV Student body. Daughter, Liz, is also attending UNLV. Empty nest is hitting hard. From Walt Wicklein: "I had a great visit with Hesh ALTMAN at the AFA-Navy game. He was still living in Maryland then and we went to the game together and dinner afterward. Hadnt seen him since we graduated and after we caught up on our histories it was like we had never had the lapse of 35 years between us. It really sums up what it means to be an RTB." Walt says, "Having grandchildren is better than canned beer." He is now the President of the Maryland Nurserymens Association and President of their Horticulture Research Foundation. He truly enjoys the on-line association with the class. "It is great that we have the technology to remove distances and renew friendships. I thank all the RTBs who spent time and money to make this possible." From Bob & Bobbie GIBSON: He apologized for getting Christmas cards out late. Of course mine were out before New Years. Bob is learning his job. All those years in Marine aviation command and control now pay off: he speaks Army, Navy, Air Force and NATO and is gaining rudimentary "Intel-Weenie" gibberish. Hes made a couple of trips to Germany and England rediscovering Europe. Bobbie and he are anxious to show the boys Hungary and Ireland, lands of their heritage. At the annual Marine Corps Aviation Association reunion at Pensacola (See photo), he visited the restoration of the Cubi Pt OClub Bar and found an old guest register with his name in it. "At last, immortality." He also managed to get to the AF-Navy game but missed the chance to join the AOG group. 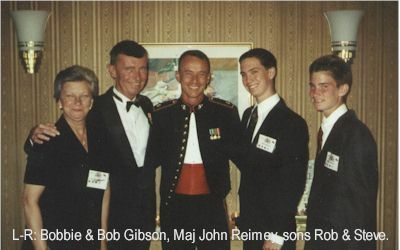 Bobbie, the 2 boys and he ended up with his office wearing their USAFA '62 hats and sweaters. He cheered for USAFA in spite of his post-graduation career change. "Ill never get over the Navy game we attended as cadets (I still hate Bellino.)" From Ted & Marcy DYKES: Ted had a 60th birthday and Marcy assembled classmates from grade school, junior high, high school and 9 RTBs. Im sure Ted was as astounded as Bob Deberry was at his. Marcy had Old Glory flown over the U S Capitol to commemorate the event. Ted and Marcy got to enjoy the sounds and scents of New Orleans during a trip for Marcy as head of the Virginia Family and Childrens Trust Fund, a position appointed by the governor. They also managed a trip to South Florida. And they are hoping their daughter and her family are assigned back to Quantico, nearby. From Pat & Charlie HALE: Charlie was the Y2K manager for his Credit Union and can take credit for the seamless transition the entire country experienced (Charlie didnt say that, I did.) Pat just finished her last letter for the Quilt Guild and is glad her year is over. (Tell me about it.) Young Charles health has been improving. The lactose free diet seems to be paying off. If he gets laid off at Boeing, he plans to go back to school. Pat & Charlie managed to visit Hawaii and meet family. Also squeezed in a trip to Branson, MO. From Bob DEBERRY: "Im sure you know (since you knew about it along with a lot of others before I did) that the party was a COMPLETE SURPRISE. Needless to say, Georgie was acting a little strange those last few weeks before this surprise party I found out she had been planning for months. But the cover story of her planning and hosting a private school "party in the park the afternoon of my birthday held up. And my brother and sister had said for a whole year they were both coming out to Las Vegas for my 60th. They used to come out regularly, so that story held up. I was going into the room to say Happy Birthday to the husband of Georgies co-workers and then we were going downtown for dinner. When I walked in the door and saw a high school classmate of mine who is also a 63 Grad and saw Gail Peck and Larry Gooch, I realized what was really going on- that I had been bamboozled but good. Needless to say it was a blast. (See photo.) Georgie has met a number of the OORTBs now and we plan to be at the 40th reunion in 2002. She likes everyone she has met. We understand why, dont we? Thats it for now. My next column deadline will probably be in mid-June. Put a note on your calendar to drop me a line or email on 1 June. I would appreciate it. 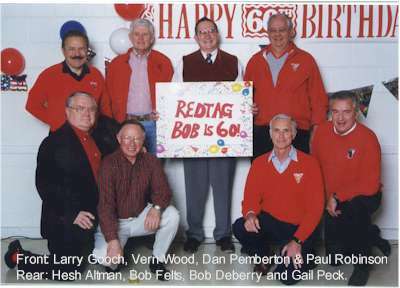 Go REDTAGS!! !